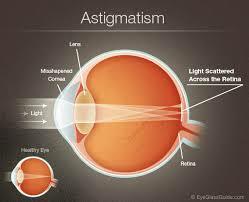 Astigmatism is a condition of the eye in which the curve of the cornea is unequal. As a result, light rays cannot be focused clearly. Vision is blurred. The eyes tire easily. The condition usually can be corrected with contact lenses or glasses. You may become aware of presbyopia when you start holding books and newspapers at arm’s length to be able to read them. A basic eye exam can confirm presbyopia. You can correct the condition with eyeglasses or contact lenses. You might also consider surgery. Strabismus is an imbalance in the muscles of the eye that causes a horizontal or vertical misalignment. It stops the eyes from simultaneously focusing on one object, so two conflicting images are sent to the brain at the same time. Normally, both eyes focus on the same object and transmit only one image to the brain. A total of six muscles attach to and move the eye, and the various types of strabismus relate to the different muscles involved. For instance, Esotropia is the name for crossed eyes. Hypertropia is the term for eyes with vertical muscle imbalance. An infant or youngster with strabismus may learn to ignore or suppress the image seen by the misaligned eye. The normal eye becomes dominant, while the misaligned eye develops reduced vision from lack of use. This loss of vision in one eye is called amblyopia, and approximately 50% of children with strabismus develop amblyopia. 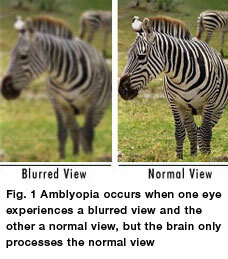 Amblyopia may also occur if vision is significantly different from one eye to the other. Eye floaters are spots in your vision. They may look to you like black or gray specks, strings or cobwebs that drift about when you move your eyes and appear to dart away when you try to look at them directly. Most eye floaters are caused by age-related changes that occur as the jelly-like substance (vitreous) inside your eyes becomes more liquid. Microscopic fibers within the vitreous tend to clump and can cast tiny shadows on your retina, which appear to you as floaters. Most cataracts develop slowly and don’t disturb your eyesight early on. But with time, cataracts will eventually interfere with your vision. Most cataracts develop in people over age 55, but they occasionally occur in infants and young children. Usually cataracts develop in both eyes, but one eye may have somewhat worse vision than the other. You may have heard about a condition called “secondary cataract” or “after-cataract.” This occurs when the lens capsule, the membrane that wasn’t removed during surgery and supports the lens implant, becomes cloudy and impairs your vision. Another term for this condition is posterior capsular opacification (PCO). A secondary cataract can develop months or years after cataract surgery. You may feel like the cataract is returning because your vision is blurry again. Cell growth on the back of the capsule gradually clouds your vision.There is no way to know who may develop clouding of the lens capsule after cataract surgery. Up to 50 percent of cataract surgery patients experience this problem.Treatment for a secondary cataract is fairly simple. It involves a technique called YAG laser capsulotomy, in which a laser beam makes a small opening in the clouded capsule to allow light through. It is a painless outpatient procedure that usually takes less than five minutes. Afterward, you might stay in the doctor’s office for about an hour to make sure your eye pressure doesn’t increase. Generally, most patients immediately experience improved vision, while some experience gradual improvement over several days. is the condition in which the two eyes have unequal refractive power. Each eye can be nearsighted (myopia), farsighted (hyperopia) or a combination of both, which is called antimetropia. Generally a difference in power of two diopters or more is the accepted threshold to label the condition anisometropia. In certain types of anisometropia, the visual cortex of the brain will not use both eyes together (binocular vision), and will instead suppress the central vision of one of the eyes. If this occurs often enough during the first 10 years of life while the visual cortex is developing, it can result in amblyopia, a condition where even when correcting the refractive error properly, the person is still not correctable to 20/20. Advanced Macular Degeneration or AMD is a common eye condition and a leading cause of vision loss among people age 50 and older. It causes damage to the macula, a small spot near the center of the retina and the part of the eye needed for sharp, central vision, which lets us see objects that are straight ahead.In some people, AMD advances so slowly that vision loss does not occur for a long time. In others, the disease progresses faster and may lead to a loss of vision in one or both eyes. As AMD progresses, a blurred area near the center of vision is a common symptom. Over time, the blurred area may grow larger or you may develop blank spots in your central vision. Objects also may not appear to be as bright as they used to be.AMD by itself does not lead to complete blindness, with no ability to see. 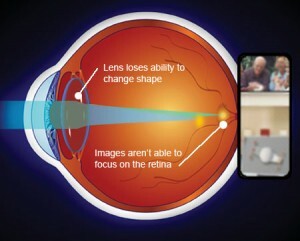 However, the loss of central vision in AMD can interfere with simple everyday activities, such as the ability to see faces, drive, read, write, or do close work, such as cooking or fixing things around the house. Diabetic retinopathy is a diabetes complication that affects eyes. It’s caused by damage to the blood vessels of the light-sensitive tissue at the back of the eye (retina). At first diabetic retinopathy may cause no symptoms or only mild vision problems. Eventually, it can cause blindness. The condition can develop in anyone who has type 1 or type 2 diabetes. The longer you have diabetes and the less controlled your blood sugar is, the more likely you are to develop this eye complication. Glaucoma is a group of eye conditions that damage the optic nerve, which is vital to good vision. This damage is often caused by an abnormally high pressure in your eye. Glaucoma is one of the leading causes of blindness in the North America. It can occur at any age but is more common in older adults. Vision loss due to glaucoma can’t be recovered. So it’s important to have regular eye exams that include measurements of your eye pressure. If glaucoma is recognized early, vision loss can be slowed or prevented. If you have the condition, you’ll generally need treatment for the rest of your life. Retinal holes and tears are small breaks in the retina, which is the lining at the back of your eye that senses light coming into your eye. Usually holes and tears do not mean you will have serious vision problems right away. However, retinal holes and tears may cause fluid from the center of your eyeball to leak behind the retina. If enough fluid gets behind the retina, the retina can separate from the back of your eye. The detached part of the retina will not work properly. Detachment of the retina is a serious condition that can lead to blindness and must be treated promptly to save your vision. The retina is the tissue layer located in the back of your eye. This layer transforms light into nerve signals that are then sent to the brain for interpretation. When your blood pressure is too high, the retina’s blood vessel walls may thicken. This may cause your blood vessels to become narrow, which then restricts blood from reaching the retina. In some cases, the retina becomes swollen. Over time, high blood pressure can cause damage to the retina’s blood vessels, limit the retina’s function, and put pressure on the optic nerve, causing vision problems. This condition is called hypertensive retinopathy (HR).